Kerala University Recruitment 2019 - Apply Online for Lecturer Posts in Kerala University, Kerala on Contract Basis. Online Applications are invited by University of Kerala from 08 Feb 2019 to 18 Feb 2019 05:00 PM. Good Academic record with at least 55% marks in Masters Degree Level in the relevant subject. Eligible candidates may apply online at Kerala University's website (direct link is given below) from 08 Feb 2019 to 18 Feb 2019 05:00 PM. Candidates log on to https://www.keralauniversity.ac.in/. Go to "Announcement > Jobs Notifications" & Select the desired post. Kerala University Recruitment 2019 - Job notification for Project Fellow Post on a project entitled “ Establishment of a Field Gene Bank of primary gene pool of Piper nigrum ( Black Pepper) occurring in Kerala and screening of selected genotypes against Phytophthora foot-rot” in Department Of Botany, Kerala University, Kerala on Temporary Basis. 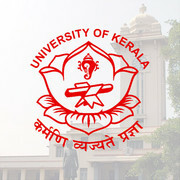 Applications are invited by University of Kerala on or before 25 Apr 2019 for 1 vacancy.